As a gossip columnist, you managed to board the Titanic undercover using a secret alias. It will turn out to be a fateful decision, however, as things aboard the ship go terribly wrong. Trapped among the Titanic's wreckage, you must earn freedom from your watery tomb. Appease your captor by re-writing history and freeing the spirits trapped aboard the 'unsinkable' luxury liner. 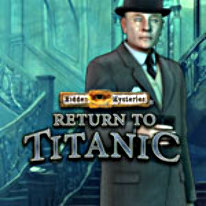 In doing so, discover why fate has chosen this destiny for you in Hidden Mysteries: Return to Titanic.